Over the years I probably subscribed to more than 100 fanzines and magazines, most of them now defunct as a result of an aging fanbase. I still receive subscriptions to five magazines and six club newsletters but it appears one of those magazines has closed the books. Blood 'n' Thunder, whose aim was to appeal to collectors of pulp magazines, old-time radio, cliffhanger serials, film noir and other retro pop culture just released the final issue, number 49/50, Fall 2016. Edited and managed by Ed Hulse, whose prose and skill at writing and presenting the facts is academic and pleasing to the eyes, provided fifteen years of pleasurable reading. Whether it be exploring the origins and roots of Tarzan in The All-Story magazine, or exploring a silent cliffhanger serial such as The Diamond from the Sky (1915), there was plenty in each issue to keep me reading for hours. Long flights on an airplane or a few hours to kill on the back porch... 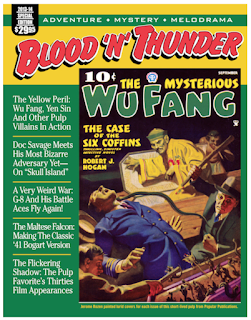 I always had an issue of Blood 'n' Thunder on hand. 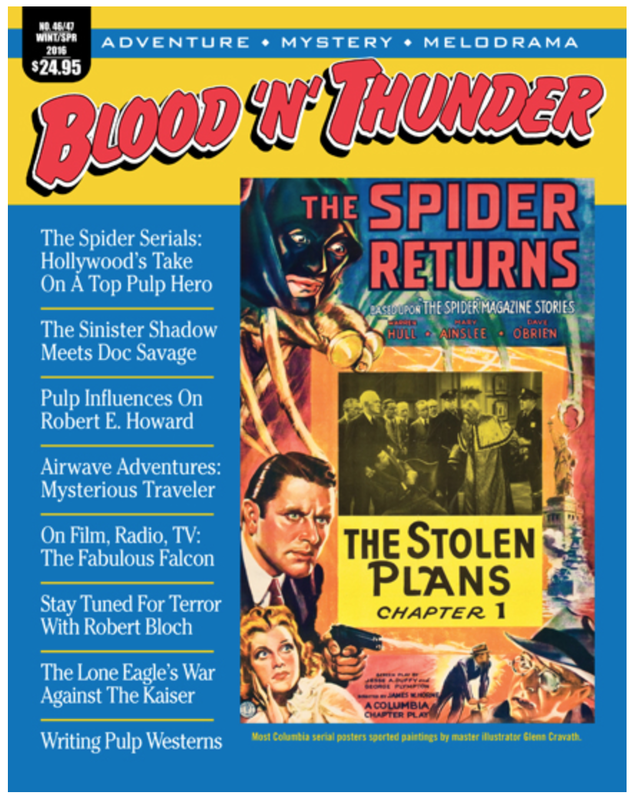 In the final issue, Ed Hulse provides a fascinating story of how the magazine came to be, the good folks who invested money into the production, and the tens of thousand son hours Ed devoted to researching a subject for articles. A two-part article on Street & Smith entailed reading hundreds of issues which gobbled up his spare time for months. As Ed explained, numerous factors including a busy life prevented him from releasing the latest issue of his magazine at each of the pulp conventions, which he did routinely for years. So he decided to throw in the towel. As Gary Larson once remarked, better to quit while you are still on a roll than to run dry and thin. I could not speak enough about Ed's magazine. 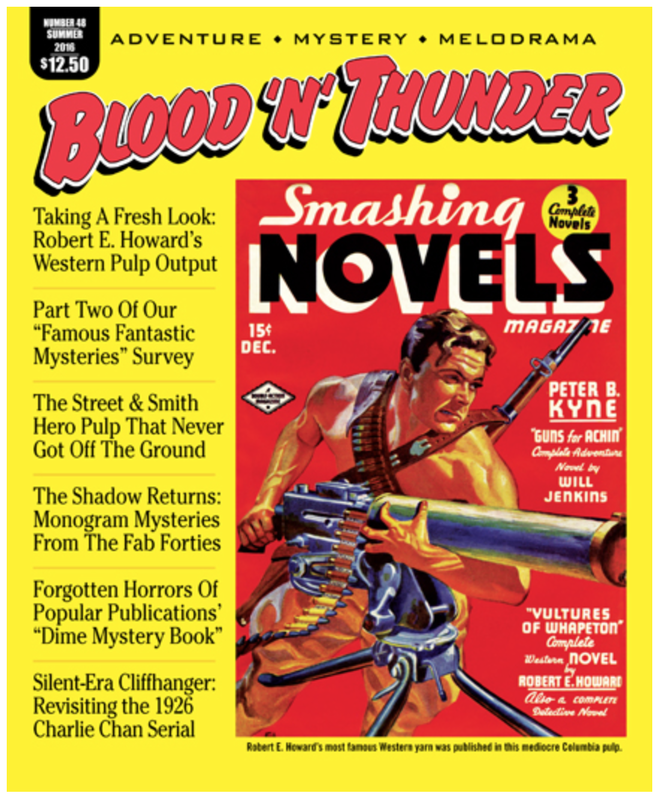 While I manage to read all of the club newsletters and fanzines (average 16 pages) that come through my office every month, magazines (average 102 pages) Blood 'n' Thunder was the only magazine that I would read from cover to cover. For one magazine (which I will keep nameless because I do not want to disappoint the editor) I have two years of issues piled up and the motivation to read the articles is not strong enough for me to challenge through them. I will one day. On the plus side, many back issues are available on Amazon.com and from Ed's site, muraniapress.com, and I recommend you buy a few. 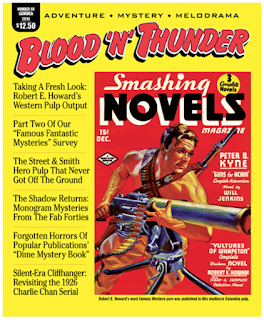 The latter issues are "bookazines," which are referred to in the industry as books with multiple contributors to simulate a double and triple magazine issue. While they may cost $14.95 and $24.95, you are buying what is essentially a book. And Ed Hulse disclosed his intentions of releasing such "bookazines" in the future, each resolving under a single theme and with no steady release date like a magazine subscription. I look forward to his one proposal about the Crime Club series (a series of movies based on mystery novels). I look forward to reading magazines and fanzines when they arrive in my mail box. That thrills has not diminished in decades. My question is this: even while clubs and organizations make the switch to offer digital copies of their newsletters and magazines, which also diminishes my need for additional bookshelves, just when will print magazines become a thing of the past? 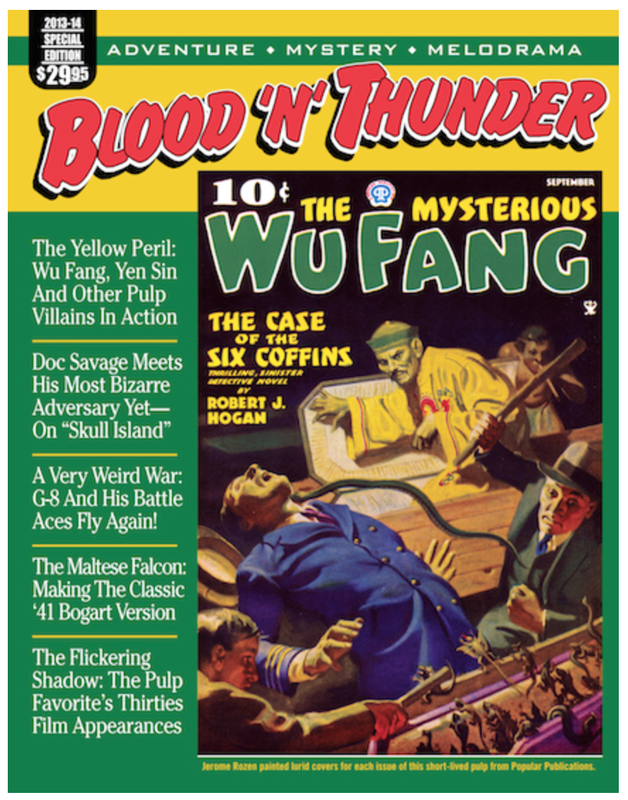 I'm sorry to see BLOOD 'N' THUNDER disappear. The amount of research Ed put into these magazines is truly impressive, particularly in an era when "research" too often begins and ends with a Google search.